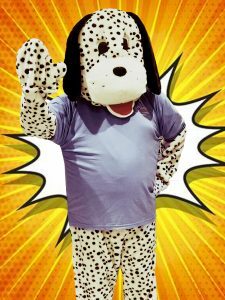 DJ is a 6 year old spotty dog available to meet you child at their birthday party. He is very shy, so doesn’t talk, however once the party gets going he jumps into character and is happy to join in the fun. DJ is friendly by nature and is DBS checked so is safe to work with children. DJ loves a good selfie. Both packages include a personalised gift and card with the partygoers name.